Reuben Timothy Morgan (born 9 August 1975) is the worship pastor at Hillsong Church UK and one of several worship leaders and songwriters in Hillsong Worship group. Prior to this he was a worship pastor at Hillsong Church in Sydney, Australia. He has written songs such as "Eagles Wings", "Hear Our Praises", "I Give You My Heart", "My Redeemer Lives" and "Mighty to Save", which won the Worship Song of the Year at the 40th GMA Dove Awards. In 2005 his first solo worship album, World Through Your Eyes, debuted at No. 3 in the Australian Christian Charts. In 2005, Morgan signed with Rocketown Records. 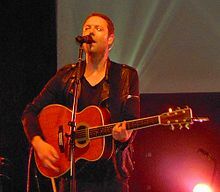 The company released his debut album in the United States, but four of the original songs were removed in favour of cover versions of Hillsong songs written by Morgan. In addition, the remaining songs were remixed and the resulting songs had a heavier feel when compared to the softer pop-rock originals. Morgan has toured extensively around the United States, Canada and Europe. A 2007 European tour featured events in Scotland, England, Germany and Sweden. Everyone, contains Morgan's interpretation of his music and was mostly written in the previous 18 months, recorded in a big sounding, studio worship without the congregational elements found in the Hillsong Live albums. Everyone largely featured covers of previously released Hillsong songs written by Morgan and was released in Australia on 2 October 2006. Morgan officially became Hillsong's new worship pastor in 2008, succeeding Darlene Zschech, however, Zschech continues to be a worship leader of the Hillsong Worship Team. On 29 June 2010, Hillsong Live released A Beautiful Exchange, an album featuring songs by Morgan. Morgan led Hillsong's 2010 tour of the United States, which kicked off on 21 July and included events in Dallas, Detroit and Los Angeles. He is married to Sarah and they have three children. "What the Lord Has Done in Me"
"This Is How We Overcome"
^ Kevin Donovan (10 July 2007). "Hillsong's Reuben Morgan to Tour Europe". Christian Today. Retrieved 16 July 2010. ^ The Hillsong Live recordings are made in the megachurch and feature live worship and singing from the congregation. ^ "Hillsong Live With Reuben Morgan Tour Begins July 21". BREATHEcast. 24 June 2010. Retrieved 16 July 2010. ^ Jackie A Chapman (3 July 2010). "The story of A Beautiful Exchange". Christian Today. Retrieved 16 July 2010. ^ Joe Montague (14 October 2005). "Giving His Heart Away : Artist Reuben Morgan". Soulshine. Retrieved 16 July 2010. ^ "Who You Say I Am". Hillsong. ^ "The Lord's Prayer". Hillsong. ^ "Can You Believe It!? Album Lyrics and Music Videos". Hillsong. Retrieved 29 September 2018. ^ "CAN YOU BELIEVE IT!? Album Credits". Zendesk. Retrieved 29 September 2018. This page was last edited on 7 April 2019, at 01:24 (UTC).